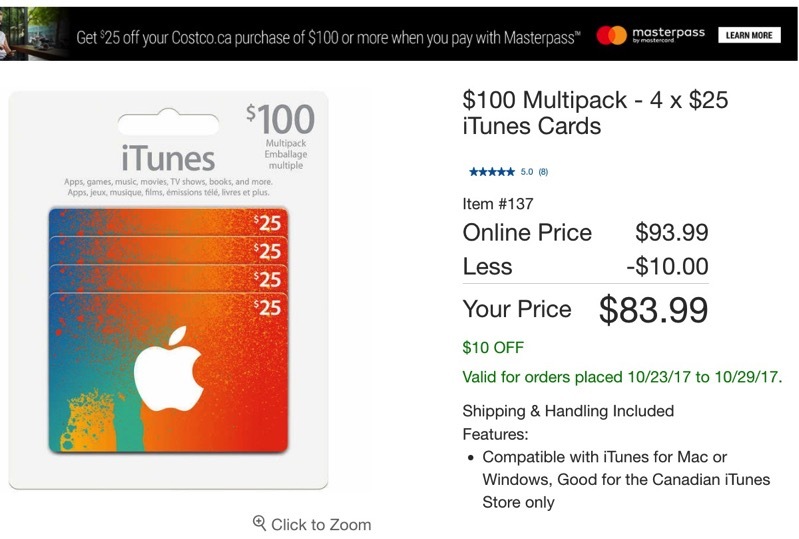 Costco has launched another iTunes card sale today, offering 20% off $100 multipacks in-store at $79.99, while priced at $83.99 online. If you haven’t heard about the Mastercard Masterpass discount yet, it offers members a one-time savings of $25 off a $100 purchase on Costco.ca and applies to items on sale as well. Costco announced back in July they would debut Masterpass as a checkout option, and now they’re pushing it hard. Once you apply these discounted cards to your iTunes account balance, you’ll be effectively saving 28.51% off any digital purchase from Apple, the best discount we’ve seen to date. That means anything in the App Store, Mac App Store, iTunes, iBookstore, in-app purchases, subscriptions (Netflix, Sportsnet, NHL, etc) and more. Costco’s iTunes multipack sale goes until Sunday, October 29, 2017. Paying a $4 premium online instead of visiting a warehouse may save you from spending $500+ on a cart full of ‘groceries’ (how come there’s never anything to eat when I get home?!). 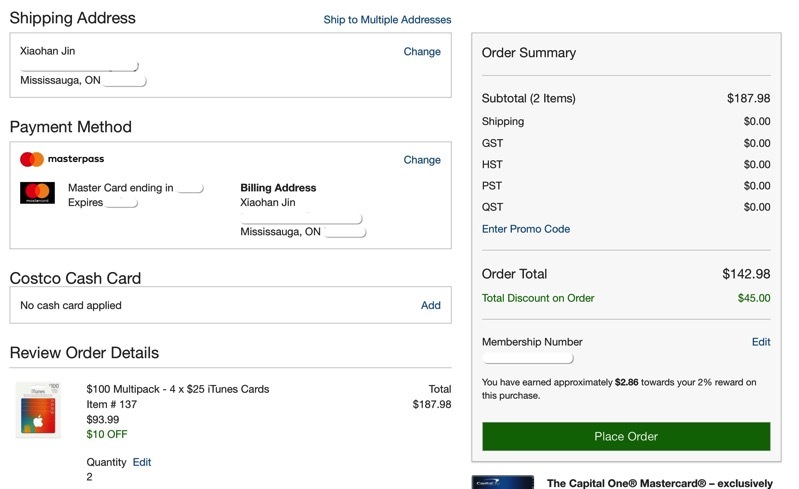 Let us know if you’ll be jumping on these discounted iTunes cards, and if you’ll be using your Masterpass discount as well (if you’re looking to buy something else with your Masterpass discount, Costco.ca has Apple TV 4K available).